My Irishness is with me all the time but for the week of St. Paddy's Day, I emphasize it. I read a little from James Joyce to enjoy the genius of his language structure, pull out my Yeats and Seamus Heaney to enjoy their lyrical tones, and make Irish Scone to enjoy the culinary sweetness of the culture. And today I have a special treat for all of you. 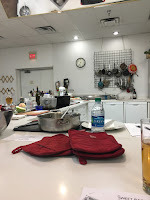 Last week I attended a cooking class at the Sweet Basil Gourmetware and Cooking School in Scottsdale. This shop is a wonderful venue for the culinary arts and it also has a cafe and a wide variety of kitchen gadgets and cookery items in the shop area. If you're in the Phoenix area and enjoy cooking in your kitchen then you should treat yourself to a class at Sweet Basil. The class I took was The Irish Table. It's not the kind of class where you sit and take notes, you work and Chef Linda Martin is there to guide the way. It was fabulous. I enjoyed it immensely. Seven items were on our menu for the night and we could choose or were assigned which item to cook. 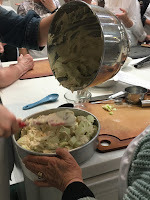 There were at least 14 people in the class and my task along with another woman was the salad - the easiest task. The one I wanted (hand pies)was already taken. Everyone was enthusiastic and ready for the experience. And Linda kept everything running smoothly. 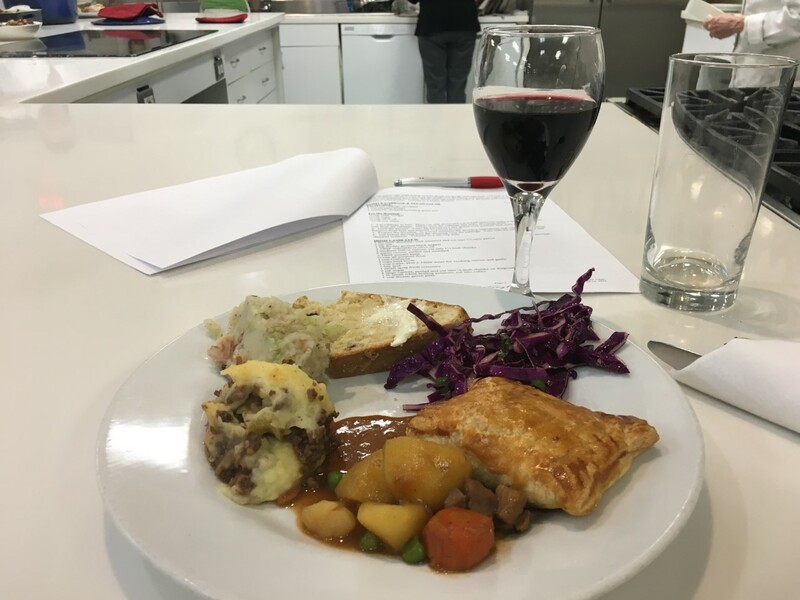 Linda is a Le Cordon Blue trained chef who enjoys sharing her craft and knowledge with those who attend her classes. 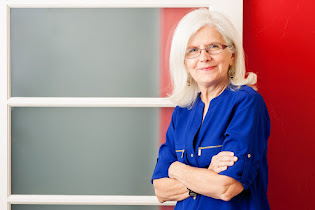 As a kitchen designer I know Linda from attending events in various showrooms throughout the Valley. 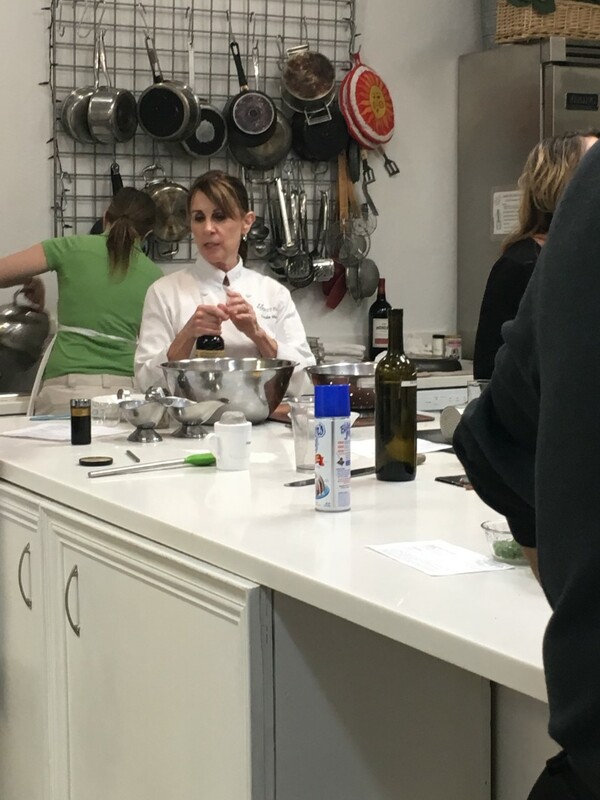 Linda would often demonstrate the brilliance of cooking on the appliances such as Decora at the design industry meetings. The menu items were always delicious. The Irish Table Menu: Beef Pasties (Hand Pies), Purple Cabbage & Pecan Salad, Irish Lamb and Vegetable Stew, Cottage Pie, Traditional Soda Bread, Colcannon, Apple Cake with Whiskey Hard Sauce. Yum. We couldn't wait to get started. One of the nice things about taking these classes is that Linda hands out recipes so you have a copy of them to take home. We all did a super job with fun conversation, a good show of humor and a great display of team work. And Linda went from work station to work station and kept an eye on everything we were doing and kept us on schedule. The food was all so good. I'll share one of the recipes with all of you. IRISH APPLE CAKE W/WHISKEY HARD SAUCE - serves 10.
and line it with a circle of parchment. Combine flour 3/4 c sugar, baking powder, cinnamon, salt, cloves, and nutmeg in a bowl and whisk. Add the butter and mix on low speed until the mixture resembles damp sand. Stir in eggs, one at a time. Add buttermilk and mix on medium high for 60 to 90 seconds, to aerate the batter and build the cake's structure. Fold in the chopped apples and transfer to the prepared pan. Top with remaining 2 TBSP sugar. Bake for 45 - 50 min. or until a toothpick inserted comes out clean. 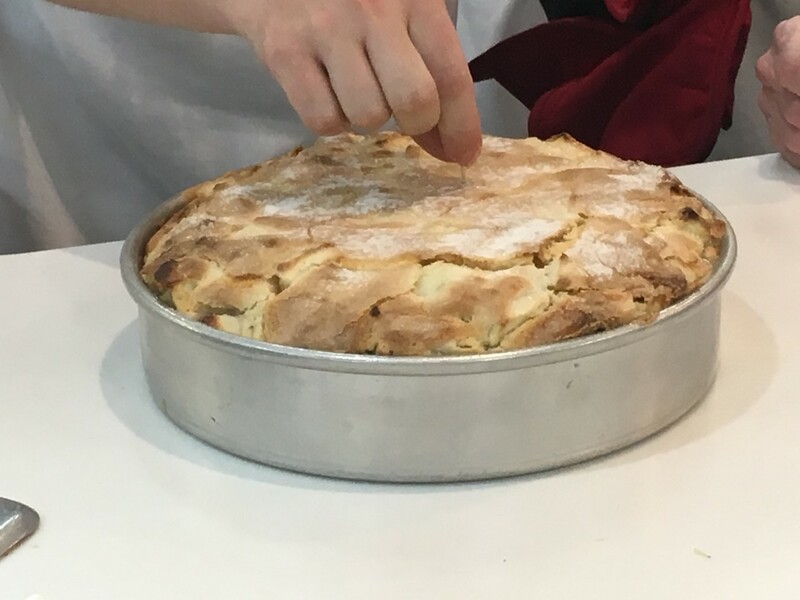 Let cake cool for at least 10 min before turning onto the serving platter. Combine sugar, cornstarch and salt in a small pot and whisk. 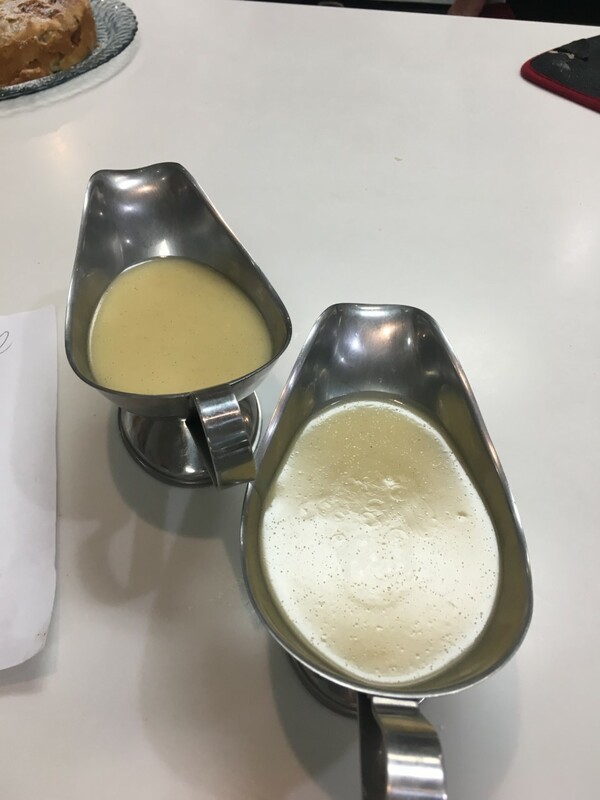 Slowly drizzle in the cream while whisking. Cook the mixture over medium-low heat, whisking occasionally, until boiling and thickened. Dust the cake with powdered sugar. Serve the sauce on the side. Good food and good conversation, you can't do better than that. We started As You Like It Designs about 15 years ago. My husband and business partner, Ralph Holland, is a woodworker and has been in the construction industry a good part of his life. I have a degree in Interior Design and decided to focus mainly on kitchen and bath spaces. Since I grew up working with my Mom in a commercial kitchen, becoming a kitchen designer was not a big surprise. 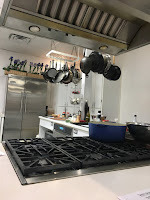 In 2002, I received certification (AKBD) through the National Kitchen and Bath Association. As a writer and designer, I live to create. I find inspiration everywhere whether it's in a book, nature, someone's smile or a design trade show. Attending trade shows allows me to keep abreast of color and design trends as well as technological advances in the kitchen and bath industry such as smart kitchens. If you are in need of a professional designer for your next project, just email me at claremarie@asyoulikeitdz.com. Recent reviews by Clare Marie K.
It's not my practice to include hyperlinks in my post unless a company has paid for that advertisement, and request a link to their site within the post. So, where the name of a company or product is blue you can click and go directly to that site.